1. Preheat the oven to 190°C, gas mark 5. Grease and line the bases of two 18cm sandwich tins with baking parchment. Put the butter, sponge mix, eggs and milk in a bowl and beat slowly with a hand held electric mixer for 30 seconds. Then increase to full speed for 2 minutes until smooth and creamy. Divide equally between the tins, level the surfaces and bake for 25 minutes until risen and pale golden. Leave in the tins for 5 minutes then transfer to a wire rack to cool slightly. 2. Combine the lime zest with the juice. Pierce the tops of the cakes all over with a skewer and sprinkle the 60g sugar over the cakes in an even layer. Drizzle the lime mixture on top and leave to cool completely. 3. 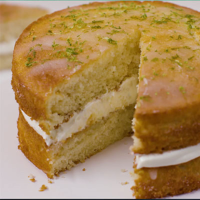 Whip the cream with the 1 tablespoon caster sugar and use to sandwich the cakes together on a serving plate. This recipe was first published in Wed Sep 13 12:09:00 BST 2017.